Wrap the Sky with Flags of Dead Arrows! When the Latari Elves march to war, the Densebois Archers form the backbone of the troops called to arms. These stoic archers with piercing eyes brandish the long bows with which they train for decades. Already formidable separately, these infantrymen become the best archers unit in the world when they are assembled. This box contains everything you need to add 1 unit of Densewood Archers to your army. Be careful this game is an extension of Runewars: Le Jeu de Figurines and cannot be played alone. 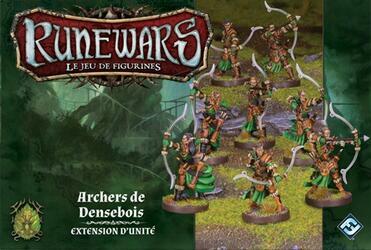 To be able to play it you must have a copy of the game Runewars: Le Jeu de Figurines .